For a Full Overview of SHIFT-IT School’s Curriculum, Click Here. Below Are Upcoming Courses and eCommunity Dates For This Season. Ready For Your Next Round Of Professional And Personal Growth?! 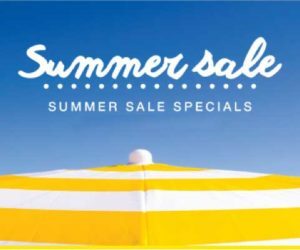 Our Annual Summer Sale Is Right Around The Corner: August 6 – 10, 2018. Save Big On Upcoming Fall Courses, Private Training And Private Coaching. Our Current Times Are Calling Us To All Step Up As Process Professionals. Get The Education, Support And Community You Need To Take Your Craft (And Life!) Up To The Next Level. For Process Professionals Who Work With Groups Or Individuals – Managers, Consultants, Trainers, Teachers, Facilitators, Therapists, Coaches, Scribes And Others. Over 82% Of Your Clients Are Visual Thinkers So It Only Makes Logical Sense To Work In Ways That Best Reach Them. 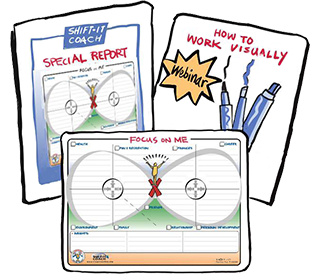 This Professional Skills Training Thoroughly Covers The Four Main Ways Of Working Visually: Studio Work, Graphic Recording, Graphic Facilitation And Graphic Coaching. Attracts Participants From Across The Globe. Includes Monthly eCommunity For Ongoing Support. 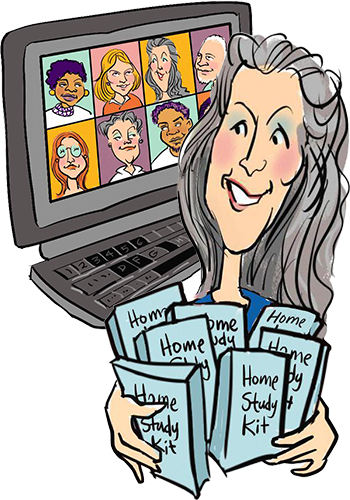 Three Options: Online, In-Person Or Via Home Study Kit. Note: Pre-requisite for Visual Coach Certification. FYI, Repeater Option available on Fall Online Training for those who have taken before and want to repeat as a guest (write us for coupon code). 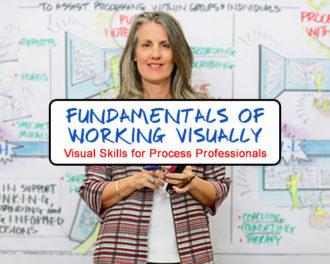 For Process Professionals Who Have Already Taken Beginner Level Visual Skills Instruction (Either Through My Fundamentals of Working Visually Or Elsewhere). 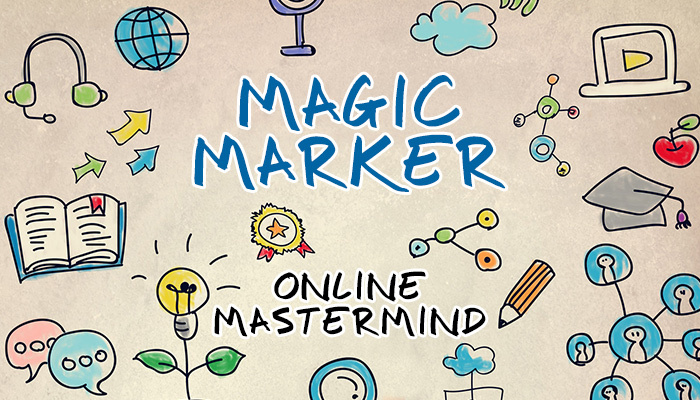 A Specialized Online Mastermind For Enhanced Support And Community With Fellow Visual Practitioners From Across The Globe. Suitable For Both Internal Practitioners Embedded In Organizations And For Self-Employed Independents. Take Your Skills And Identity To Your Next Level! Note: Pre-requisite is Fundamentals of Working Visually (or equivalent experience). Each Magic Marker Program is a unique experience, come as many times as you like for continued inspiration and development! Your Right Brain Knows Everything … However the Trick Is To Learn How To Receive It’s Messages. 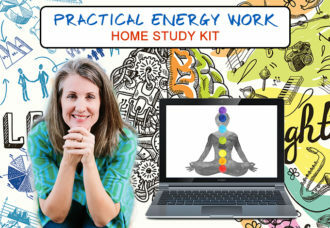 This New Home Study Kit Is Chock Full of Pragmatic and Fun Inner Work Techniques That Enhance Your Personal And Professional Life. Solve Problems. Navigate Tricky Situations. Improve Health. Create Right Livelihood and Abundance. Improve Relationships. Heal Ancestry. Boost Creativity. Includes Monthly eCommunity For Ongoing Connection With Like Hearted People From Across The Globe. 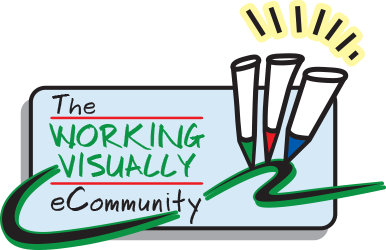 This eCommunity Is A Complimentary Perk For Those Who Have Taken My Visual Skill Programs: Fundamentals of Working Visually, Magic Marker Programs, Visual Coach Certification And/Or Business Essentials for Process Professionals. To Keep Going In Community With Like-Minded People From Across The Globe. It Includes Drop-In Monthly Webinars, Video Recording Library And 24/7 Forum. 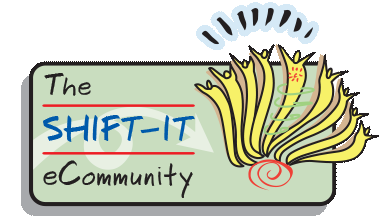 This eCommunity, Is A Complimentary Free Perk For Grads Of My Coaching Programs: SHIFT-IT, Practical Energy Work, Visual Coach Certification And My Private Coaching Practice. To Keep Going In Community With Like-Minded People From Across The Globe. It Includes Drop-In Monthly Webinars, Video Recording Library And 24/7 Forum.